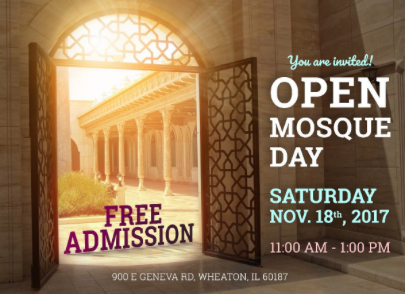 The Islamic Center of Wheaton is organizing an Open Mosque Day on Saturday, November 18th, from 11 a.m. to 1 p.m., at the mosque located at 900 E. Geneva Road. "The goal of this Open Mosque event is to invite our neighbors of all faiths, as it is a pressing need to have continuous programs such as these in as many communities as we can to help in the outreach messages of peace and understanding of each other. This is a way to help fight the rise of Islamophobia" said Sheikh Omer Haqqani, director of outreach at the Islamic Center of Wheaton. "This jointly held event with Dr. Sabeel Ahmed of GainPeace is a way to help people come visit the Mosque, and ask questions that concern them the most." There are great benefits to hosting such events, which are healthy to our communities along with our neighbors, helping build bridges to form alliances within our neighbors and communities. The Open Mosque will be attended by many guests and public officials from the community. Ala Fahmy, President of Islamic Center of Wheaton, urges neighbors and community members to join for this free Open Mosque event. To RSVP, please call or text 630-709-3104, or RSVP here to help in logistical planning. Media personnel are invited to record, interview and invite our leadership for further details about this Open House and other such outreach events.